On a sunny, yet chilly day, Latino men are huddled outside of Abbey Court Condominiums or the BP gas station across the street on Jones Ferry Road. Some of these day laborers are residents of Abbey Court, which also serves as the location of The Chapel Hill and Carrboro Human Rights Center, led by Director Judith Blau. The center proclaims that human rights are for all people with no exceptions. Recently the center has been advocating the passage of new legislation to protect the rights and wages of day laborers in Carrboro and Chapel Hill. This is part of the center’s mission, as one of its goals is to “go to bat” for those who face discrimination in these towns. Day laborers, who are often hired for jobs that vary on a day-to-day basis, are sometimes denied pay. Pay could be denied for projects that are a day’s work or for projects that take a few weeks. The center has been petitioning the Carrboro Board of Aldermen to make such an exploitation, which is currently a civil offense, into a criminal act. Many of these laborers are undocumented workers in Carrboro and Chapel Hill. But Blau said according to federal labor laws, there is no distinction for protection between those who are documented and those who are not. These workers simply wait and hope for any work they are lucky enough to obtain. Blau said that many workers started coming to Rafael Gallegos, the assistant director of the center, telling him that they worked for two weeks and weren’t paid. Or that they were getting such low wages that they couldn’t possibly survive on them. Or that they were injured on the job and employers weren’t taking care of their medical expenses. Gallegos is a sociology graduate student at UNC-Chapel Hill, originally from Delicias, Chihuahua, Mexico. His thesis, which is on day laborers, specifically concentrates on those in Carrboro. Gallegos said that demographically, nationality plays a big role in who is a day laborer or who is not. He said that New York has a much more diverse population of day laborers, but here in North Carolina, it is a bit different. Gallegos stressed that immigration is not happening just recently. He also stressed that the center and advocating for rights does not stop with day laborers or just the Latino population. When he spoke to the Board of Aldermen, he made it clear that it wasn’t just Latinos he was worried about. “I want it to be clear, for the Aldermen, it was never the intention for just Latinos or immigrants,” he said. Gallegos said that he feels sure that something positive will come from what the center is doing because the Board of Aldermen and residents are supportive. They see the problems day laborers struggle with. Blau said that they received a positive response after meetings they had with the board. Not everyone agrees. Gallegos said he started receiving angry e-mails claiming the center was a “radical Latino” group aiming to validate that “legals are here.” Gallegos said he did not understand this because he stated in his speech to the board that protection is for everyone, no matter where somebody is from or what somebody looks like. He said that this is what the center is all about. Gallegos said that having a presence and helping the town become more aware would help with finding solutions to problems regarding human rights. He said that wage theft is more than a financial withholding. Aside from financial and potential medical complications, Gallegos said these workers begin to question their humanity. When they don’t get paid, they feel as if their work is not worth enough to get monetary compensation. Their situation does not just affect them as individual workers, but also the day laborer community and their families as a whole. Alfonso Hernandez, 19, an arts major at Durham Technical Community College from Carrboro, works at the center with its after-school programs. When Hernandez was a child, his father was a day laborer. 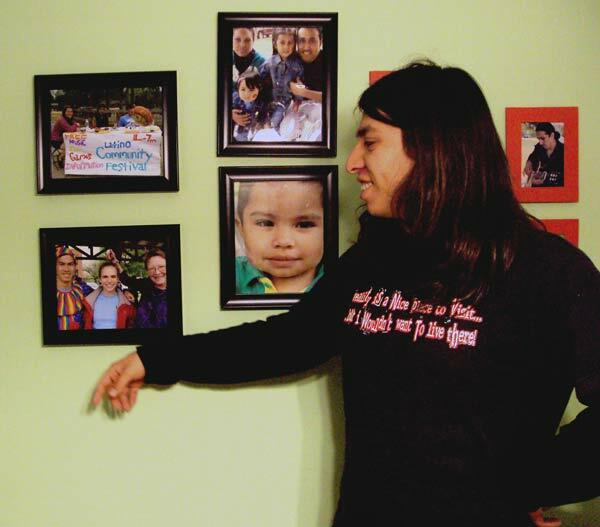 Hernandez was born in Carrboro but moved to Mexico, coming back to Carrboro when he was 6 years old. He said his living situation while he was in Mexico was not necessarily unique. He said other families experience the same trans-national living situation. Some workers will be here in America while their families remain at home in other countries so that they can send money back to them. Hernandez volunteers with the after-school programs that help children with homework and other schoolwork. Blau said they don’t inquire of the children’s parents or of their parents’ professions, but some of the children in the after-school programs do have parents who are day laborers. “It’s tough on kids because they don’t know why the economy is falling apart,” Blau said. Hernandez said his brother experienced months without work. He said that some laborers have a similar situation to his brother. He said having no work is hard for them and stresses them out. He said that it gets to a point where they don’t know what to do. In addition, the language barrier makes getting hired more difficult. Gallegos said it isn’t particularly fair because the work that laborers wish to perform doesn’t require much communication and they can follow directions without being fluent in English. “When two people come together who don’t speak the same language and one has power and the other doesn’t, it is just a setup for trouble,” Blau said. With all these barriers, Blau, Gallegos and Hernandez remain positive about the community of Carrboro and the future for the rights of day laborers. Gallegos said that he hopes the center and the town can come to a compromise that will work for everyone involved. He said he hopes things will ease up for day laborers once the economy takes a turn for the better.